Hanoi Old Quarter - There’s an old Vietnamese saying, “Hanoi has thirty-six streets and guilds – Jam Street, Sugar Street, Salt Street…”. Inside a modern and dynamic city, there appears an antique quarter, the Hanoi Old Quarter – the represented eternal soul of the city. 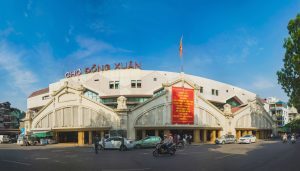 These days, most Vietnamese and Westerners are familiar with the phrase “Hà Nội - Ba mươi sáu phố phường” (translated as “Ha Noi - 36 districts” or “Hanoi – 36 Old Streets”), or “Phố cổ Hà Nội” (translated as “ Hanoi Old Quarter ”), the top special historical vestige and sight-seeing of the capital, luring international visitors thanks to their mostly original state. Where is Hanoi Old Quarter located? Located between the Lake of the Restored Sword, the Long Bien Bridge, a former city rampart, and a citadel wall, the Old Quarter (consisting of 36 old streets inside) started as a snake and alligator-infested swamp. It later evolved into a cluster of villages made up of houses on stilts, and was unified by Chinese administrators who built ramparts around their headquarters. The area was named "Dominated Annam" or "Protected South" by the Chinese. How old are the streets? 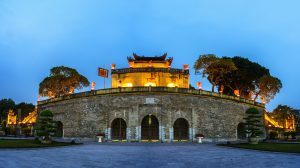 It would be a big surprise should you know that Hanoi Old Quarter came into being at the time King Ly Thai To selected Thang Long as the country’s capital in 1010, that is, the streets have a nearly 1,000-year old history and became crowded & lively in 15th century. What makes them unique is that many of them remain in their very ancient architecture of the 15th century. Up to now, it has been the oldest continuously developed area of Vietnam. What are their names’ origins? Due to their long-lasting age, they are called “Old Quarter” or “36 Old Streets” (as consisting of 36 member streets). Similarly to the Guilded age of Europe, “Ha Noi's 36 districts” is Vietnam's version of the guild concept. In the past, as artisans moved to the capital city to do business, they gathered together in this area to share the resources. As a result, many of the streets were named after the crafts sold at that individual street. Pho Hang Bun (Vermicelli), Pho Hang Ma (Paper Product), Pho Hang Bac (Silver), etc. are examples of the streets carrying the name of the products sold there. The phrase “36 pho phuong” often causes much confusion for most people; “Phố” means a street or a place for merchants to gather to do business, while “Phường”, a district or a guild of artisans specializing in a particular trade (phuong cheo, phuong tho, etc.). Yet, in any case, both are right to some extent. 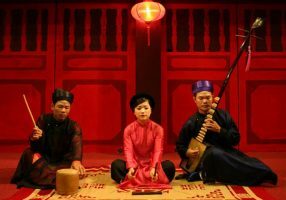 Specialized craft streets and guilds: Most tourists are eager for exploring the old streets well-known for each one’s specialized A corner of Hang Gai Street Hang Gai Street offers silk clothing ready-made and tailored, embroidery, and silver products. Hang Quat, the street that formerly sold silk and feather fans, now stuns the visitor by its brilliantly colored funeral and festival flags and religious objects and clothing. To Tich Street connects the above two and is still the wood turner's street. Hang Ma glimmers with shiny paper products, such as gift wrappings, wedding decorations and miniature paper objects to burn for the dead. Lan Ong Street is a sensual delight of textures and smells emanating from the sacks of herbal medicinal products: leaves, roots, barks, and powders, etc. Coming here, you may feel as if you were in a classical-styled area in terms of both architecture and product types! 36 old streets or more? Although the old section of Hanoi is often called the "36 Old Streets," there are more than 36 actual streets. Some researchers believe that the number 36 came from the 15th century when there might have been 36 guild locations, which were workshop areas, not streets. When streets were later developed, the guild names were applied to the streets. Others attribute the 36 to a more abstract concept. The number nine in Asia represents the concept of "plenty." Nine times the four directions makes 36, which simply means "many". In fact, there are now more than 70 streets in the area. Although many of the streets no longer sell the products after which they were named, some still do. 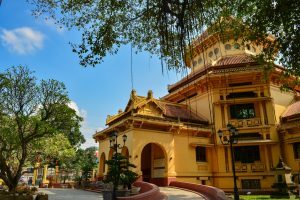 Today, Hanoi Old Quarter has become the unique classical feature of Hanoi, and the inspiration of numerous writers, poets, and painters, and one of the desired tourist destinations in Hanoi.